Today’s End of Life Care review has recognised the great strides we’ve made to improve care for our patients who are at the end of their lives. Read " Review shows end of life care continues …"
Queen’s Hospital continues to become a healthier place to be – just weeks after the introduction of a fruit stall, a Healthy Hike has started. The Healthy Hike consists of short guided walks around the hospital grounds and is for visitors and staff to encourage them to move more. 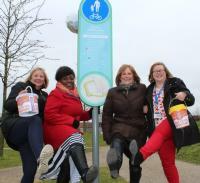 Read " Queen’s Healthy Hike launched to get sta…"
The national Nutrition and Hydration Week was marked with a range of healthy and fun activities at Queen’s and King George hospitals. Our Finance Director Jeff Buggle was among executives and other senior staff enjoying a Come Dine with Me style meal with patients. Read " Fruity Faces for Nutrition and Hydration…"
The emergency departments (EDs) at Queen’s and King George hospitals were extremely busy dealing with the record number of attendances. Read " Increasing numbers at A&E…"
Smokers visiting Queen’s and King George hospitals were encouraged to quit the habit to mark the national No Smoking Day (Wednesday 9 March). 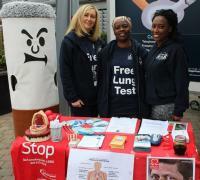 Barking and Dagenham’s stop smoking service brought its roadshow to Queen’s Hospital on 10 March and King George Hospital on 11 March. Read " Staff and patients encouraged to quit th…"
A market stall full of colourful fresh fruit has come to Queen’s Hospital – much to the delight of patients, staff and visitors. Romford Market trader David Perrott will be outside the Romford hospital, run by the Barking, Havering and Redbridge University Hospitals NHS Trust, over the coming weeks as part of a trial. Read " A taste of Romford Market comes to Queen…"
Staff at Queen’s Hospital and members of a Romford support group donned Bandanas for Brain Tumours Day. The national day was organised by the Brain Tumour Charity to raise awareness of brain tumours and funds for research into early diagnosis. Read " Hospital staff don bandanas to raise awa…"
Tommy Whitelaw has shared his moving account of caring for his late mother Joan for five years following her dementia diagnosis with staff at Queen’s Hospital. He became a campaigner to raise awareness of the condition after Joan died. Read " Dementia campaigner shares moving story…"
A Bring Me Sunshine party has been held at King George Hospital to raise funds for the Stroke Association. The colourful party was organised by staff on Beech Ward, which specialises in rehabilitation for patients who have had a stroke. They managed to raise more than £200. Read " Party brings sunshine to stroke patients…"
We announced back in early 2014 that we had introduced a new reporting system which had identified several issues with our reporting of waiting times, dating back several years. We carried out an urgent piece of work, looking closely at the data, which showed that thousands of people had been waiting too long to be seen.